After H.H. the 17th Gyalwa Karmapa Trinley Thaye Dorje left Tibet in 1994, his welcoming ceremony took place in the Karmapa International Buddhist Institute in New Delhi. To have this good news spread all over the world we were asked to do a documentary about it.The reason why we were asked is that we had some experience in Buddhist film production and photography. All of us were long-time Karma Kagyu practitioners; two of us were Tibetologists and one, a photographer and film-producer. At that time, we arranged a professional non-Buddhist film team to come to India for the shooting. The high costs were covered by the Sangha in Austria.The first film about H.H. Gyalwa Karmapa was published in 1994: The Return of the Karmapa.In 1995, we were again asked to do some documentaries in India. We were shooting the daily life and education of H.H. Karmapa in KIBI, as well as a report about the life of the monks in Rumtek under very difficult conditions during that time.In 1996, we did the documentary of the first Karma Kagyu Conference in New Delhi. Later in the year, H.H. Karmapa visited Bodh Gaya for the first time. All these can be seen in the film “The 17th Gyalwa Karmapa – Years of His Youth”, published 1998. In 1999, H.H. Karmapa was invited to Taiwan and Southeast Asia, and in the beginning of 2000, he visited Europe for the first time. After the official program, he received transmissions by Tjobgye Tri Rinpoche in France. We have always been there, travelling with him and shooting photos and videos. This is what we do until today. Since around 2000, the project is directly under H.H. Karmapa. In 2004, he named the project “The Karmapa Documentary Project”.We do not just focus on the big public events, but also on the education, teachings and side stories. It is a multimedia-biography of the life of H.H. Karmapa. In more than 1000 hours of video footage and 10-thousands of photos, we can follow the most important and historical steps in H.H. Karmapa´s life. The work is mainly done on a volunteer basis. A part of the expenses for equipment and travels is covered by the sale of videos and photos. For the rest, we need the support of sponsors. Karmapa Documentary Project is part of the non-profit making trust “Vienna Dharma Projects” based in Vienna, Austria, which supports the activities of the Karma Kagyu Tradition. All the work involved is done on a purely voluntary basis.The project is carried out under the guidance of Gyalwa Karmapa Trinley Thaye Dorje and Kunzig Shamar Rinpoche. 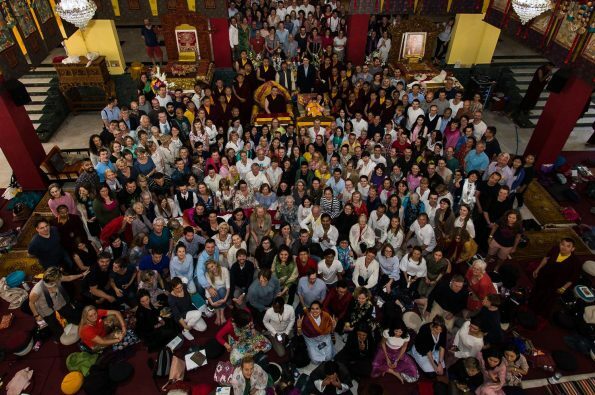 Karmapa Documentary Project continues to grow only with the generosity and support of our dharma friends worldwide. We welcome and appreciate your financial support of our project. If it is more convenient for you to donate to Karmapa Documentary Project via bank transfer, our bank details in Austria are listed here. Please give your name as the reference number so we can track your donation.